As great as Columbus is, we’re definitely not number one in preserving historic buildings. 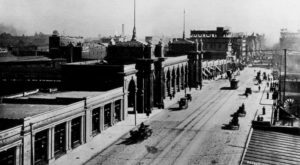 You could say we’ve had some historic building faux pas, but we’re not nearly as bad as you might think! Columbus has a number of the most awe-inspiring churches that feature exquisite architecture. 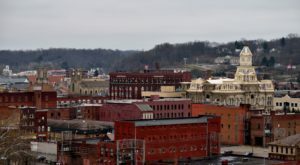 Many of them are on the National Register of Historic Buildings. If you’d like to get a closer understanding of the architecture of some of our oldest churches, here is a very mini Art History lesson. 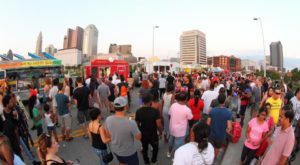 In Columbus you will mainly see churches in the Romanesque Architecture style and the Gothic Revival Architecture style. Romanesque architecture combines ancient Roman and Byzantine styles. You will frequently see semi-circular arches, thick walls, decorative arcading, and somewhat flat and rounded domes. By contract, Gothic Revival Architecture will give you high stretched out towers and windows, decorative patterns, scalloping, and lancet windows. 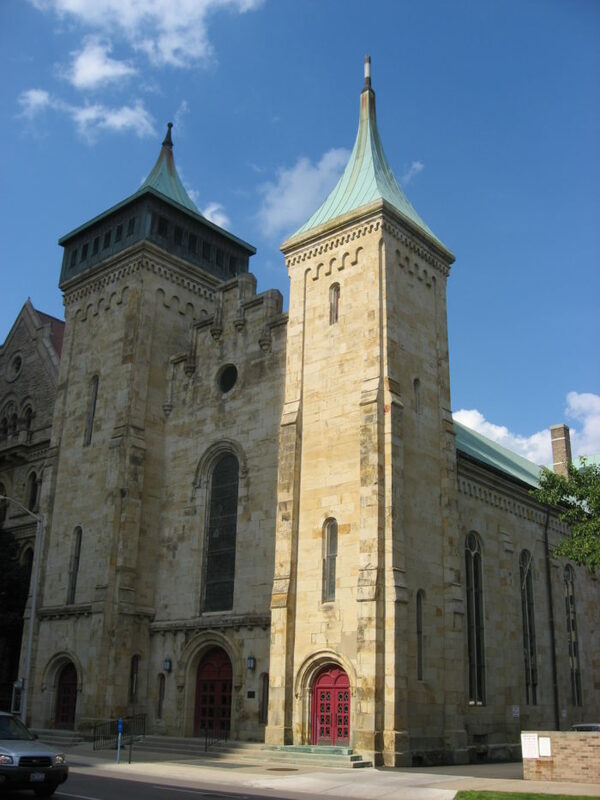 Ready for a historic tour of Columbus’s churches? This is the oldest Christian church building in Columbus. It carries the Gothic Revival Style and was constructed with more than 800,000 bricks. The church was completed just as Irish immigrants began to arrive in Columbus. The church was shared for some time, until the Irish split off to form Saint Patrick Church. Holy Cross Church is located at 212 S 5th St., Columbus, OH 43215. 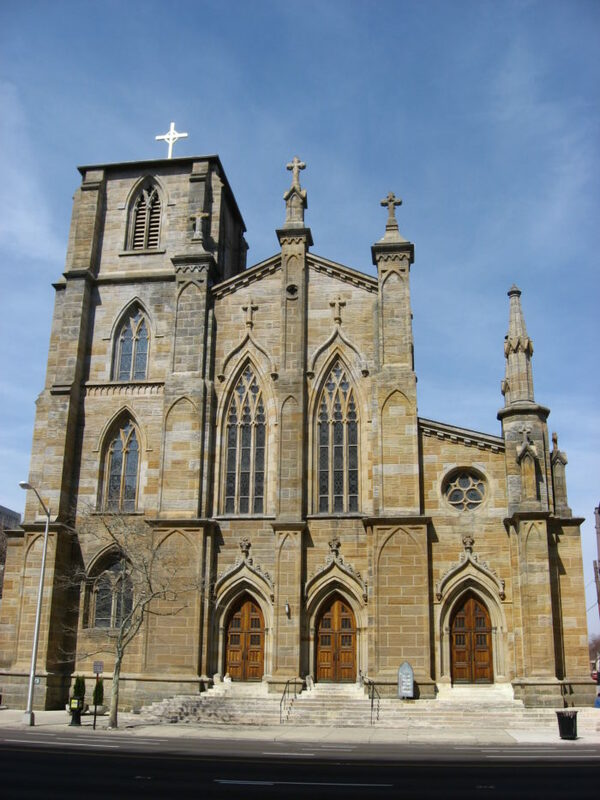 Saint Patrick Church is the second oldest Catholic church in Columbus. After Columbus received a rush of Irish immigrants, the church was shared by German and Irish worshippers. Nevertheless, space was limited, and in 1850 they decided to split. 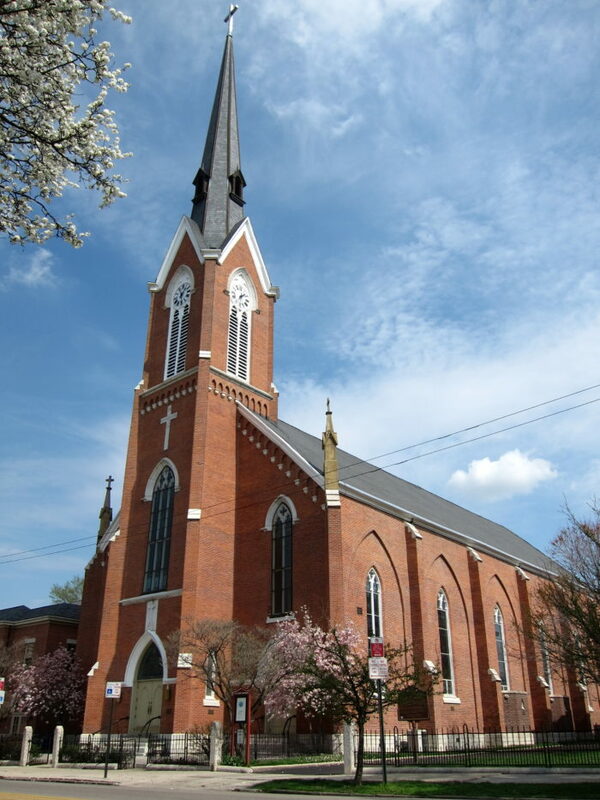 Construction on Saint Patrick Church began in 1851, and the church was designated in 1853. The church carries the Norman Gothic style, which was used by Normans, who populated Ireland in the 12th century, and used to build some of the greatest castles of Ireland. 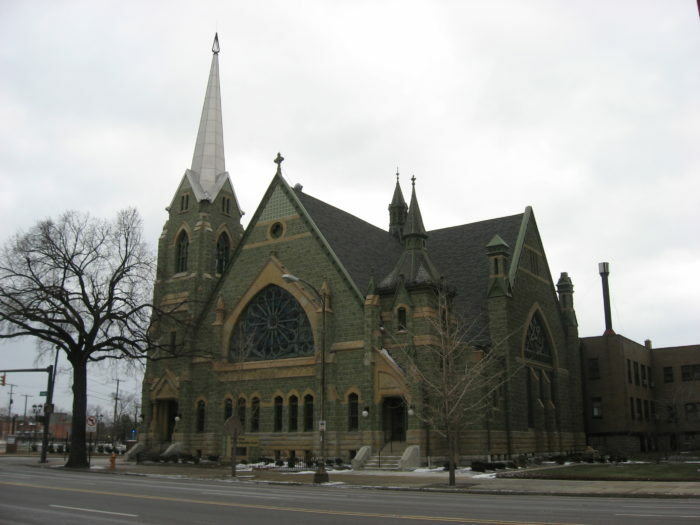 Saint Patrick Church is located at 280 N Grant Ave., Columbus, OH 43215. Erected in 1856 by architect George Kannemacher, this church features both the Romanesque and Gothic architectural styles. You can recognize the Gothic influence in the tall steeple, while the body of the building carries Romanesque features. Trinity German Evangelical Lutheran Church is located at 404 S 3rd St., Columbus, OH 43215. 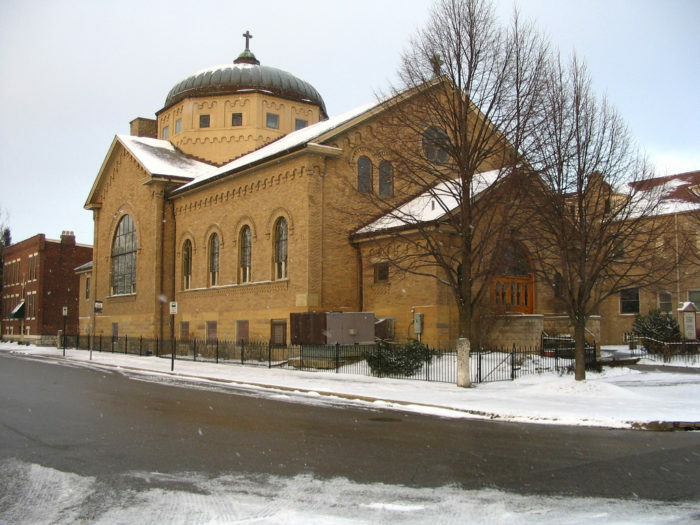 Completed in 1857, this church was built in the Romanesque style by architect Sydney Stone. You can recognize Romanesque features such as semi-circle windows and doorways and the pinched roof design. The church was closed in 2011 and is now being used as a performance venue. Second Presbyterian Church is located at 132 S 3rd St., Columbus, OH 43215. Sitting in the middle of downtown at Broad and 3rd, this beautiful church was completed in 1866. It displays the Gothic revival style of architecture in its peaked and elaborate windows, triangular forms, and long towers. 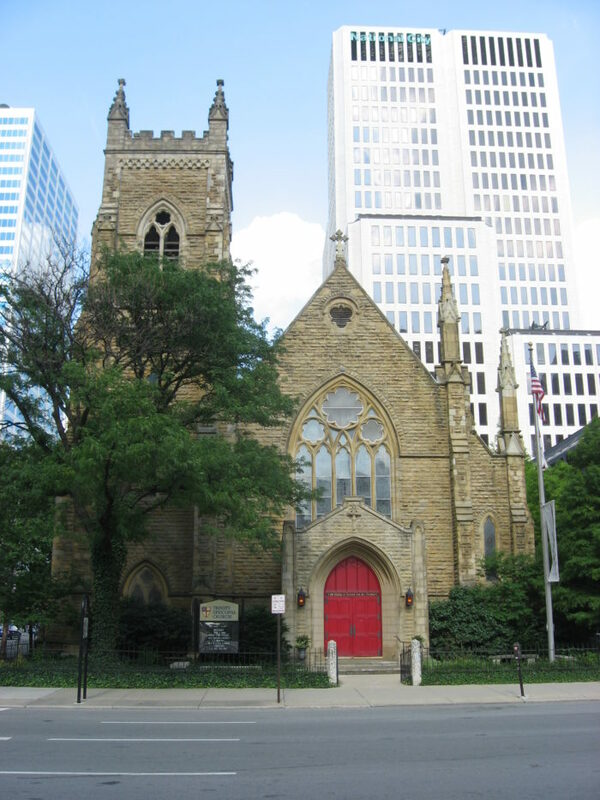 Trinity Episcopal Church is located at 125 E Broad St., Columbus, OH 43215. 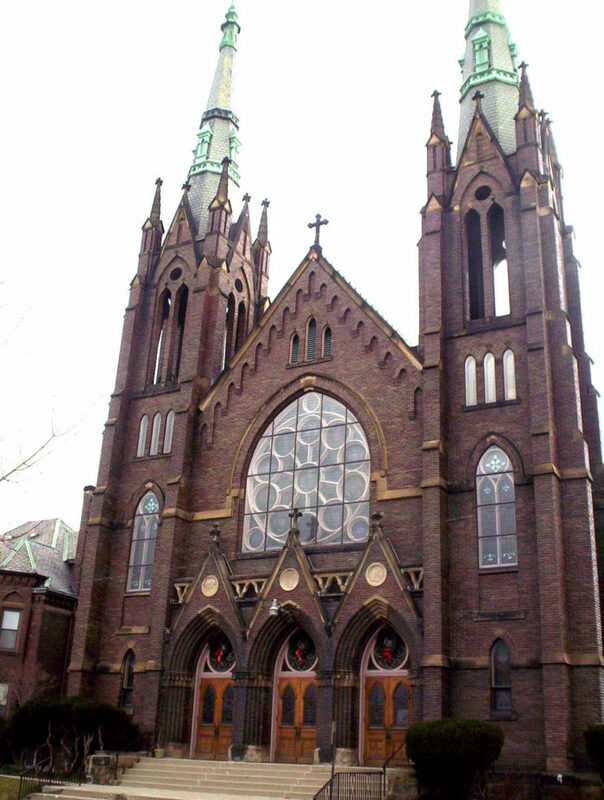 St. Mary's displays the Gothic Revival architectural style. 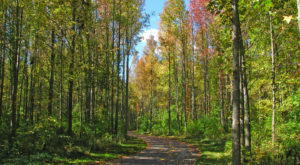 Its construction began in 1866 and it was consecrated in 1868. 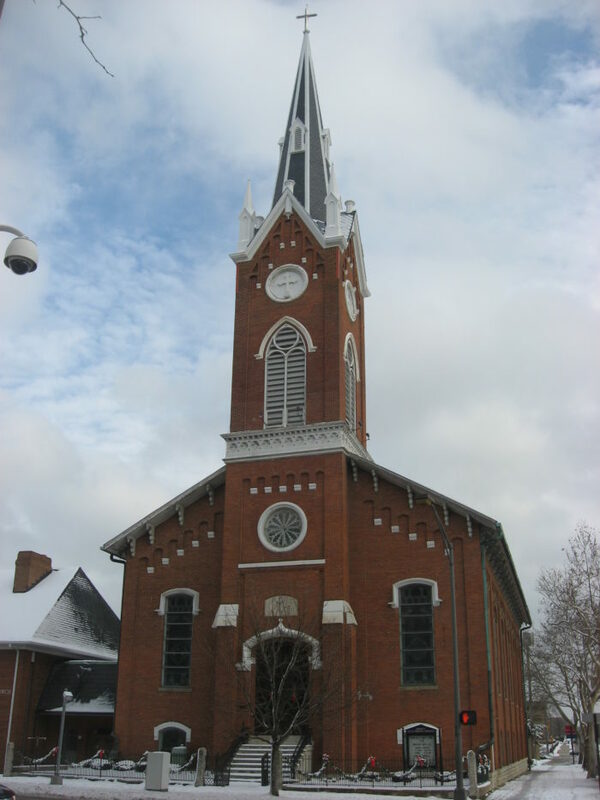 The church's spire is 197 feet, making it the tallest building in German Village and a very visible landmark. Saint Mary of the Assumption Catholic Church located at 684 S 3rd St., Columbus, OH 43206. Construction on Saint Joseph Cathedral began in 1866 to alleviate overcrowding in Saint Patrick Church. The building was constructed using ashlar stone quarried in Licking and Fairfield counties, and was designed in the Gothic Revival style. 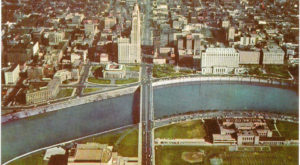 The Broad Street side was to be framed by two towers, but both towers remain incomplete. 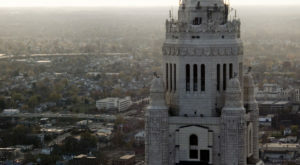 Saint Joseph Cathedral is located at 212 E Broad St., Columbus, OH 43215. This High Victorian Gothic style church was completed in 1885. It features green serpentine stone, art glass windows and high towers. During his term as Governor of Ohio, President William McKinley and his family worshipped at the church. Broad Street United Methodist Church is located at 501 E Broad St., Columbus, OH 43215. The East Broad Presbyterian Church was completed in 1887 in the Romanesque style. You can recognize the Romanesque architecture in the round semi-circular arches prevalent throughout the structure. This feature contrasts with the pointed arches and more triangular forms of the Gothic Revival style. East Broad Street Presbyterian Church is located at 760 E Broad St., Columbus, OH 43205. With its flat dome, wide angles, and beautiful semi-circle arched windows, this church is a perfect example of Romanesque architecture. The first cornerstone of the building was laid on September 1, 1895 by Bishop Watterson, who consecrated the church a year later. Saint Francis of Assisi Catholic Church is located at 386 Buttles Ave., Columbus, OH 43215. 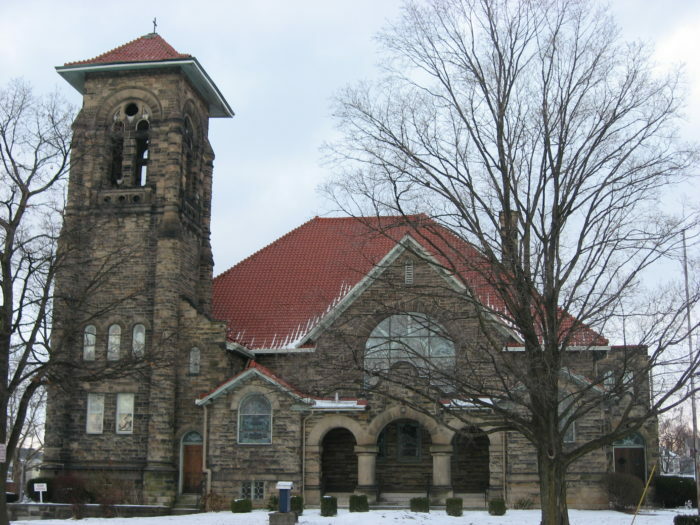 Saint John Church was built for the historic Old Oaks neighborhood, around Ohio and Livington avenues, which was then becoming populated with middle and upper class homes. Work on the church began in 1898 and was completed a year later. Saint John features the Gothic Revival architecture style. 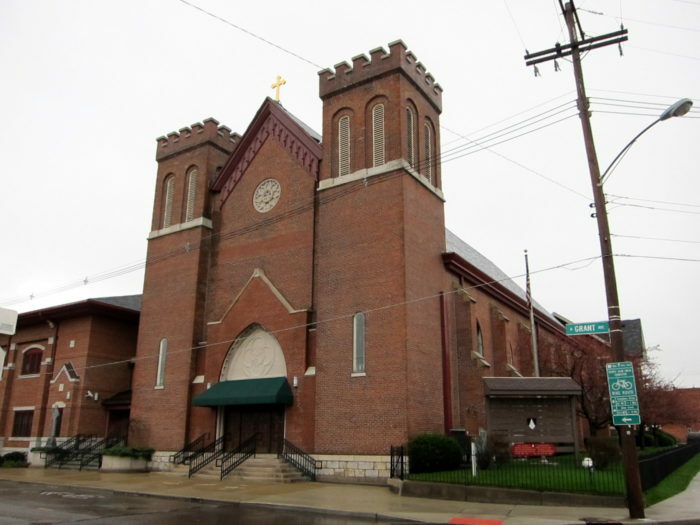 Saint John Catholic Church is located at 648 S. Ohio Ave., Columbus, Ohio, 43205. 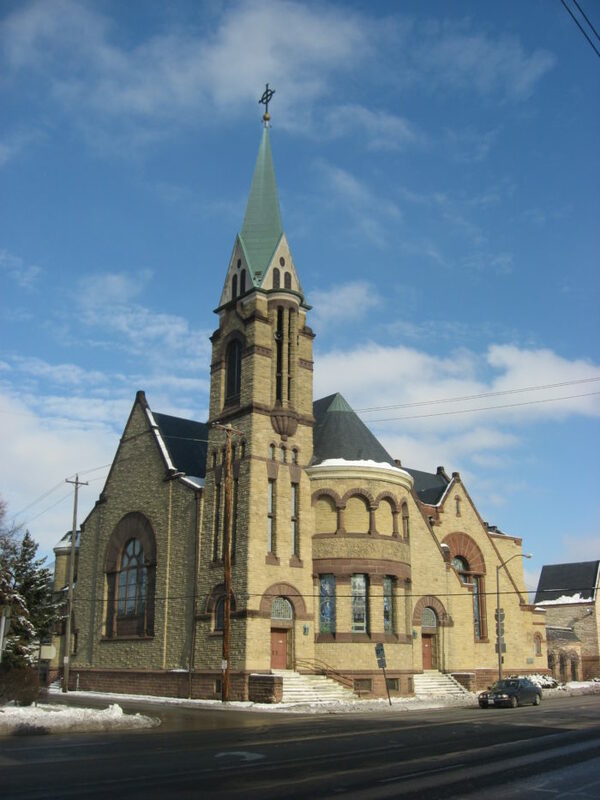 Completed in 1903, Saint Paul's Episcopal Church was built in a Late Gothic Revival style. Still based on the desire to restore medieval architecture, the Late Gothic style eliminates some of the more elaborate and ornamental features and moves toward more practical and a flatter construction. 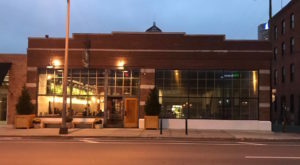 Shiloh Christian Center is located at 787 E Broad St., Columbus, OH 43205. 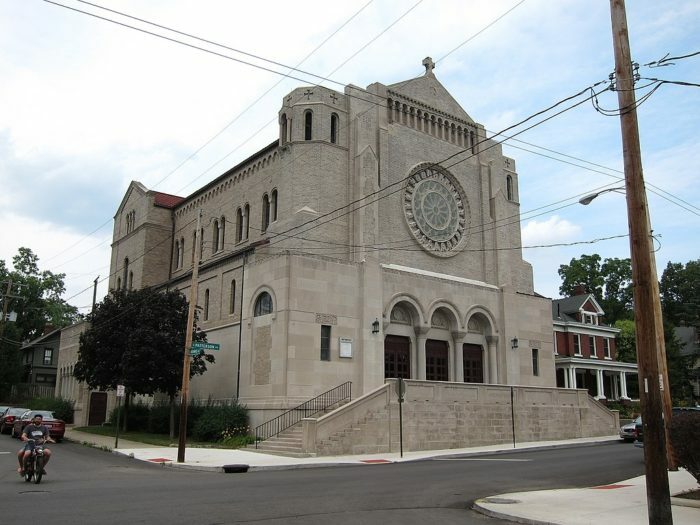 To accommodate Columbus's growing population as it began to expand north of the city center, the Holy Name Roman Church was built on Patterson Avenue in was is now Old North Columbus. Unlike the many Gothic style churches in the city, this building displays Romanesque architecture. The Romanesque style is evident in the flatter roof and semi-circle arches. Completed in 1907, this church was then located in an exclusive residential neighborhood. The church was built in a Mission Revival style that borrowed influence from Spanish Colonial architecture. This style looked to simplify the overall architecture and frequently included long arcades and rough-hewn stone walls. Broad Street Christian Church is located at 1051 E Broad St., Columbus, OH 43205. 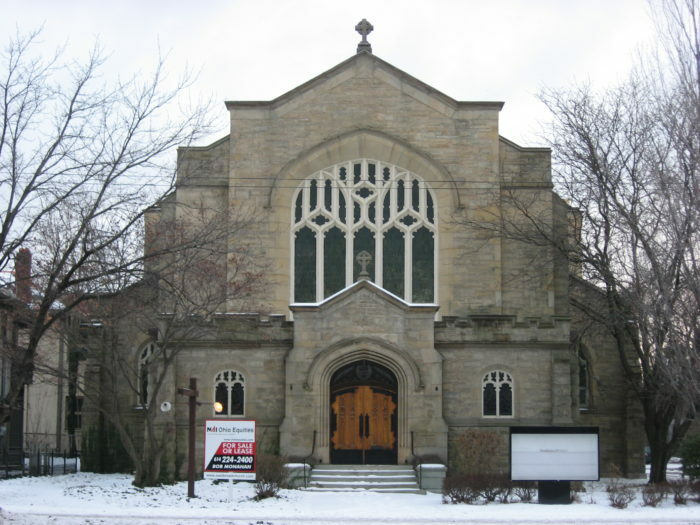 Although the current Cathedral was not built until 1990, it is a unique church in Columbus as it features a Byzantine style. Byzantine architecture drew from Roman architecture, but developed into its own distinct style. 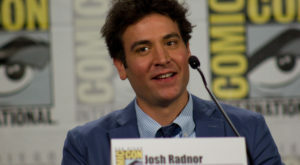 It can often be recognized by a flat circular dome or a series of connected domes as the roof of the structure. 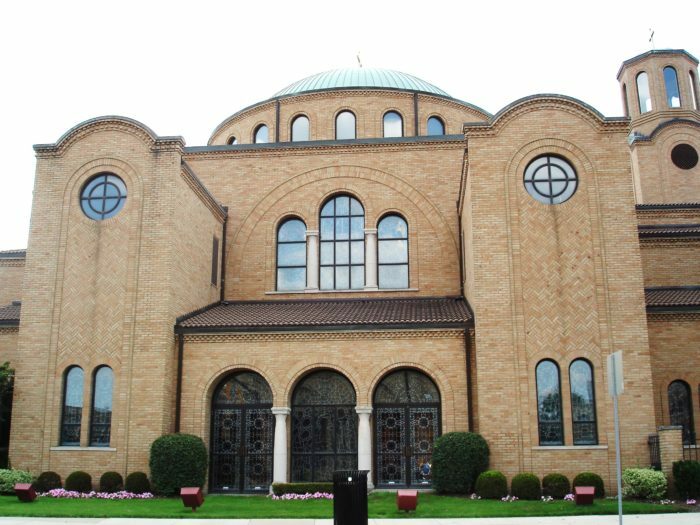 Greek Orthodox Cathedral is located at 555 N High St., Columbus, OH 43215. Phew, that was a lot of history, but it’s pretty interesting, huh? The best thing is all of these churches are right here in Columbus, so grab your camera and discover this incredible architecture up close. Which local church is your favorite?